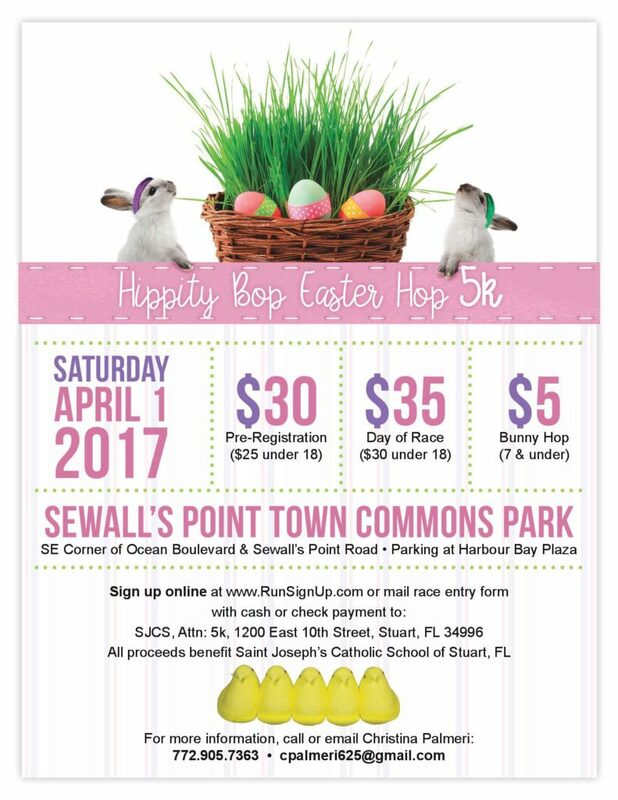 Join the Saint Joseph’s Chargers for Stuart’s Inaugural Hippity Bop Easter Hop 5k in the scenic neighborhood of Sewall’s Point. Chipped timing provided by Mike Melton with MCM Timing and Results. First 250 pre-registered race participants will receive our new custom Easter finisher medal, tech running shirt and a canvas boat bag with swag. Pre-registered Bunny Hop racers will receive a race number and bunny ears. Pre-registration ends Thursday night, March 30th. Race packet pickup Friday, March 31st, at Fleet Feet in Stuart from 12-6pm and Race Day at Sewalls Point Park from 6-6:45am. Day of race registration starts at 6:00 am. Race starts at 7:00 am. Awards for Overall male/female winner, Top 3 Male/Female in each age category, Best Individual Costume, Top Team and Most Creatively Costumed Team. Walkers and Strollers welcome! Wear your Easter costume and enjoy the fun! Post-race refreshments will be available. Day of race registration starts at 6:00 am. Race starts at 7:00 am.